This entry was posted in News on July 20, 2017 by Liberation. Amandla! Comrade chair, distinguished guests, comrades! I am delighted, also, that comrade Ronnie Kasrils is here with us. He sent most of us on our amazing, life-changing missions to South Africa or the front-line states and he holds a very special place in our hearts. Thank you, Ronnie! After the Rivonia trial ended in 1964, with Nelson Mandela and other leaders jailed for life, almost all the other ANC members had to go into exile, to avoid arrest and torture. Then they were faced with the problem: how were they to carry on their liberation struggle inside the country when they were outside? They came up with a brilliant idea. They would recruit young, white internationalists, mainly in the London Area – people who had no personal connection with South Africa and were therefore not known to the racist regime. We could enter the country posing as tourists, business people or honeymoon couples, without arousing suspicion. The regime assumed all white people were racists like them – and that was a bad mistake. Some of the London Recruits were students at the London School of Economics, including several young Trotskyists belonging to the International Socialists. Some had no political label. However, the great majority of the Recruits were young workers belonging to the British Young Communist League or, in a few cases, the Communist Party. Most of our expenses were met by the Soviet Union. Some Recruits received training in the Soviet Union or Cuba. In 2005 I began researching and editing the book, London Recruits – the secret war against apartheid that was published in 2012. When I began the book, I knew that there were other Recruits but I had very little knowledge of who they were, how many there were or what they did. Each of us only knew our own little part of the story, and even that we had kept secret for decades because the habit of secrecy was so deeply ingrained. Besides, it seemed to belong to another era.I was amazed at what I found. Some smuggled large quantities of weapons into South Africa. Some did reconnaissance. Some helped MK fighters to enter the country. Some smuggled thousands of letters and packages into South Africa and put them in the post. However, the main activity was to set off leaflet bombs or other leaflet distribution devices, along with street broadcasts using amplified cassette players. We did that once a year every year from 1967 to 1971, each time hitting five cities simultaneously – Johannesburg, Port Elizabeth, Durban, East London and Cape Town. This hit the headlines and told the people that the ANC was not defeated. The leaflets also brought news and gave advice on how to conduct the struggle, and they brought hope. 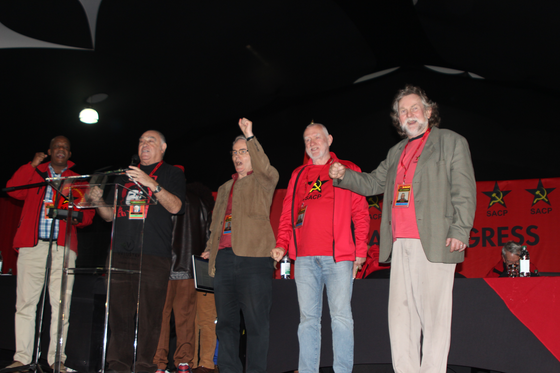 I will never forget the beginning of the street broadcast that comrade Pete Smith and I set up in Durban in 1970. After 15 minutes of silence – which was our getaway time – the voice of Robert Resha boomed out, “This is the African National Congress. This is the African National Congress. This is the voice of freedom”. This was followed by the choir of London exiles singing the ANC anthem Nkozi Sikelel’ iAfrika. Then there was a speech and more songs. We make no money from the book; all royalties go to the Nelson Mandela Children’s Fund. We also have an excellent website, londonrecruits.co.uk, that contains lots of new material. On Wednesday, I visited the Museum of the Armed Struggle at Lilliesleaf Farm, Rivonia, which has a special section devoted to the London Recruits. Our story is now being made into a documentary film, called London Recruits, that will be premiered in London in January. It will be more than just the film of the book, because the film company has done a huge amount of research. British trade unions have given the film terrific support. The film also has a website londonrecruits.org.uk. I want to mention three Recruits in particular because they were arrested and tortured: Sean Hosey, born in Dublin; on his second mission he walked into a trap and served 13 months awaiting trial and then five years in prison; Alex Moumbaris, a Greek-Australian, who was arrested in 1972 while helping MK fighters to enter South Africa by land; he was sentenced to twelve years in jail but escaped after seven and a half years; and Marie-José Moumbaris, Alex’s French wife, who was also arrested and tortured but was released after a few weeks. When I asked Alex to describe his torture, he replied that there are different levels of torture and he wouldn’t want his suffering to be compared to that of the black comrades. We now know the names of 66 people whom we can call London Recruits. Besides the British people, these include four from the USA, four Irish people, one Greek, one Greek-Australian and one Frenchwoman. One, only recently discovered, came from Britain’s Ugandan Asian community. She worked in Botswana. Thirteen of the 66 are women. How significant our efforts were is for others to judge. We know that the South African people liberated themselves from the evil apartheid regime but we are happy to have played a part, however small. The defeat of the apartheid regime struck a mighty blow against racism all round the world, not least in Britain, so we are grateful for that. Comrades, we were not busybodies, interfering in the internal affairs of another country that were none of our business. The apartheid system was a crime against humanity and capitalist Britain was up to its neck in the crime. The British Parliament founded the Union of South Africa on the basis of institutional racism. Most of the banks and big corporations, and the finance houses of the City of London, invested heavily in apartheid South Africa and profited hugely from it. The British diplomatic service did its utmost to protect South Africa from international sanctions. Those institutions are still in place. That is why our struggle continues. Comrades, the ideals that motivated us in our youth are now more relevant than ever. We hope that our story will inspire people, especially young people, to fight for a better world and this wonderful award, this great honour, will help to achieve that. Thank you!